Call 1-800-236-7862 for a Free Trial! Note: Username and password are required to view lesson materials. View related Timely Topics articles. See details. FM138 More Labor or Larger Equipment? NOTE: For more SAFETY LESSONS, see our complete list of lessons containing safety information. Timely Topics are short special reports with internet resources. They are prepared by the AgEdNet.com staff. 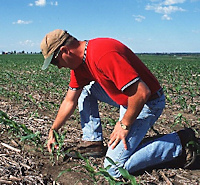 01/31/07 -- What's Up with Corn Prices? Photo credit: NRCS photo by Norm Klopfenstein. To subscribe to AgEdNet.com or for a "free trial,"
call us toll-free at 800-236-7862. Copyright © 1995-2019 Stewart-Peterson Inc. All Rights Reserved. STEWART-PETERSON and AGEDNET.COM are Registered Trademarks of Stewart-Peterson Inc.
AgEdNet.com®, a service of Stewart-Peterson Inc.